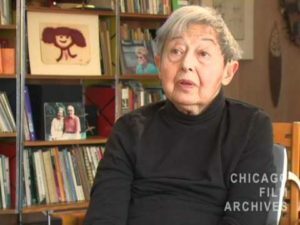 Millie (Mildred) Goldsholl – (1920-2012) was the head of the Film Department at Goldsholl Design and Film Associates (another notable female, Susan Keig, headed the Design Department), one of Chicago’s leading graphic design studios in the 1950s. The studio became recognized for their animations, progressive hiring practices and developing corporate branding packages for various companies. Our Mort & Millie Goldsholl collection contains commercials and industrial films that Goldsholl Design and Film Associates made for their clients, experimental films and animations made by both Morton and Millie, unedited travel films shot by Morton and Millie and films (primarily animated) that the two collected over the years. Millie’s films are among our favorites here at CFA. An early student of the Chicago School of Design (now IIT), Millie created films that are expressions of Maholy Nagy’s vision of industry, art and design. They are playful, human and profound all at once. The same thing, of course, can be said of Millie.